2 We Saw Thee Not 2-4 We saw Thee not when lifted high, Amid that wild and savage crew; Nor heard we that imploring cry, Forgive, they know not what they do! But we believe the deed was done, That shook the earth and veiled the sun; But we believe the deed was done, That shook the earth and veiled the sun. We saw Thee not when lifted high, Amid that wild and savage crew; Nor heard we that imploring cry, Forgive, they know not what they do! 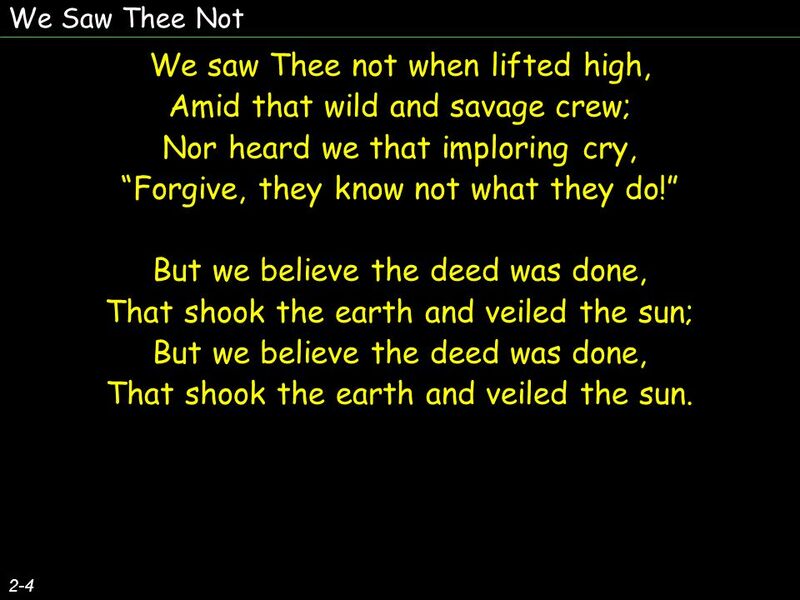 But we believe the deed was done, That shook the earth and veiled the sun; But we believe the deed was done, That shook the earth and veiled the sun. 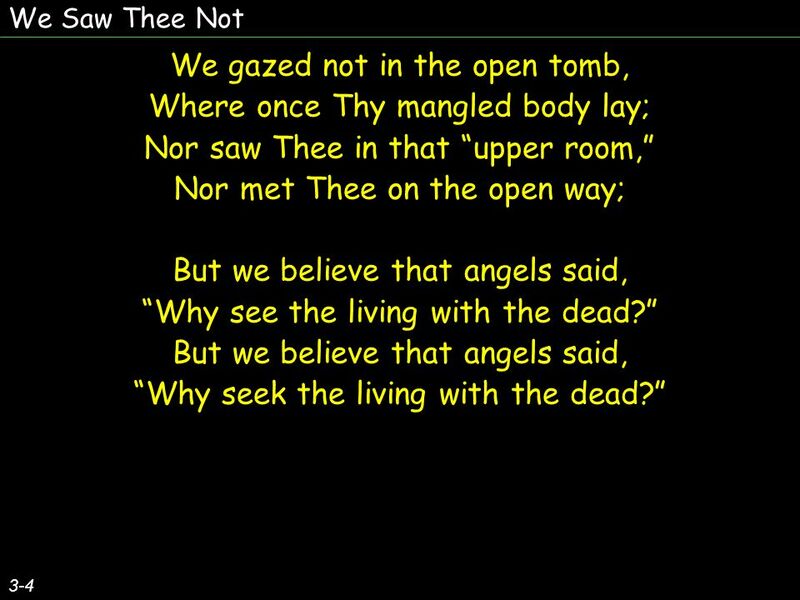 3 We Saw Thee Not 3-4 We gazed not in the open tomb, Where once Thy mangled body lay; Nor saw Thee in that upper room, Nor met Thee on the open way; But we believe that angels said, Why see the living with the dead? But we believe that angels said, Why seek the living with the dead? We gazed not in the open tomb, Where once Thy mangled body lay; Nor saw Thee in that upper room, Nor met Thee on the open way; But we believe that angels said, Why see the living with the dead? But we believe that angels said, Why seek the living with the dead? 4 We Saw Thee Not 4-4 We walked not with the chosen few, Who saw Thee from the earth ascend; Who raised to heavn their wondring view, Then low to earth all prostrate bend; But we believe that human eyes Beheld that journey to the skies; But we believe that human eyes Beheld that journey to the skies. 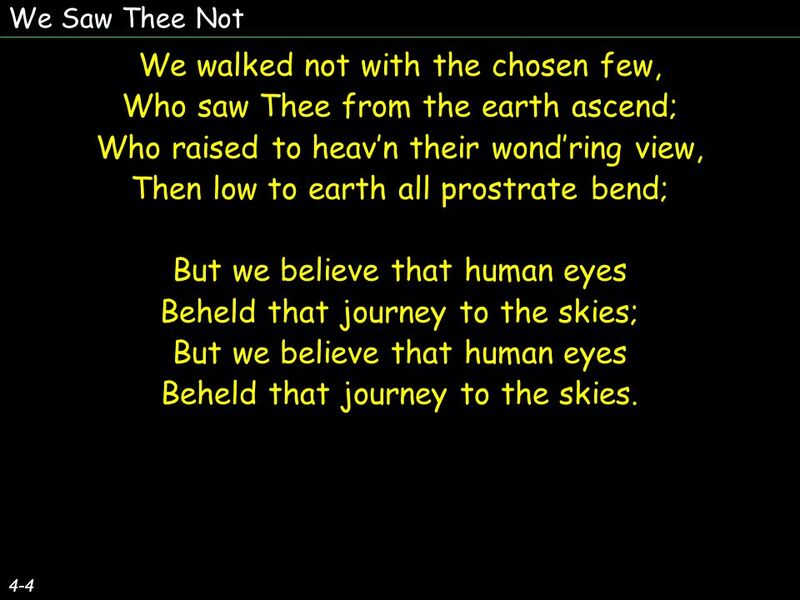 We walked not with the chosen few, Who saw Thee from the earth ascend; Who raised to heavn their wondring view, Then low to earth all prostrate bend; But we believe that human eyes Beheld that journey to the skies; But we believe that human eyes Beheld that journey to the skies. 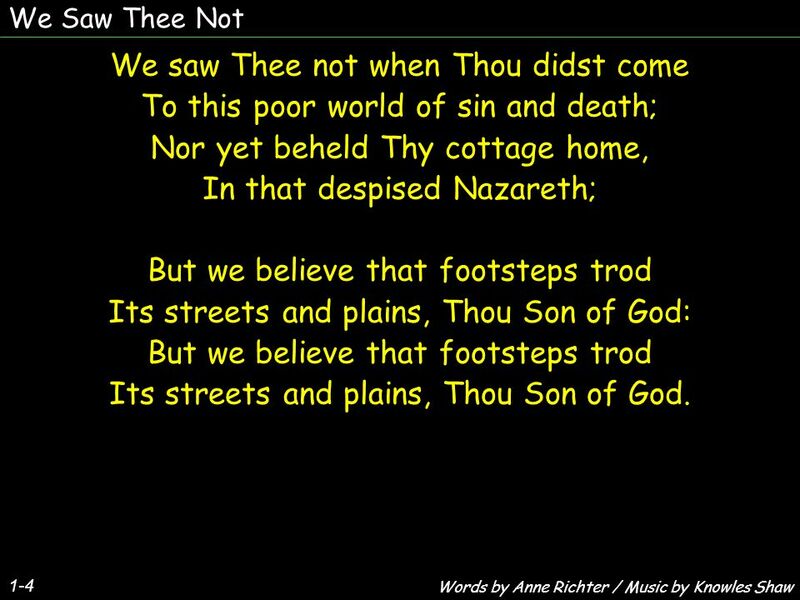 Download ppt "We Saw Thee Not 1-4 We saw Thee not when Thou didst come To this poor world of sin and death; Nor yet beheld Thy cottage home, In that despised Nazareth;"
O Little Town of Bethlehem O little town of Bethlehem, How still we see thee lie! Above thy deep and dreamless sleep The silent stars go by. Angel voices, ever singing Round thy throne of light, Angel harps, for ever ringing, Rest not day nor night; Thousands only live to bless thee, And confess. Fight the good fight with all thy might; Christ is thy strength, and Christ thy right; Lay hold on life, and it shall be Thy joy and crown eternally. More Love To Thee More love to Thee, O Christ, More love to Thee! Hear Thou the prayer I make On bended knee; More love to Thee, O Christ, More love to. JOSEPH, A TYPE OF CHRIST J ESUS Royal Brother OSEPH. THE THREE ANGELS’ MESSAGES 3. THE GLORY OF GOD. GLORIFY GOD: GLORY OF GOD WHAT IS THE GLORY OF GOD? EXODUS 33:18, 19 And he said, I beseech thee, show. EYES TO SEE Luke 24 Part 3 Part 1 - SEEING THE LIGHT Part 2 – BELIEVING IS SEEING. ACCEPTANCE 27 October “Therefore if anyone is in Christ, he is a new creature; the old things passed away; behold, new things have come.” 2 Corinthians. 1. Our Opening Prayer God, our Father We praise You and we thank You. Lord Jesus bless me today and my family and my teacher. Come Holy Spirit fill my. #114 Thou Didst Leave Thy Throne Thou didst leave Thy throne and Thy kingly crown When Thou camest to earth for me, But in Bethlehem's home there was found.